Combined, our Pro Tool Guide team members have over 10 years of experience dealing with power tools. That’s why we are confident that we know a thing or two about power tools. This time, we wanted to pick 3 cheap log splitters for you. After 15 hours of testing, consulting other experts and reading online reviews, Boss Industrial ED8T20 is the best log splitter under $1000 and our top recommendation. It’s an electric powered model with 8 ton of driving power. On top of that, we love its portability, convenience and durability. Here are our top 3 picks for log splitters that will cost you less than $1000. 2 of our picks are gas powered and one is electric. Whether you are looking for a commercial or home application log splitter we have something for you. From 3 leading brands, we have picked 3 log splitters that meet the demands of both professional contractors and homeowners. We have also included both gas and electric powered options. And since portability is a great concern for some log splitters users, we have an easily portable model. If you have ever tried out the EC5T20 then you probably know about the convenience and portability that Boss Industrial provides in all its products. With the Boss Industrial ED8T20, this manufacturer brings about the same level of convenience and portability only adding a notch higher to the performance this time. This log splitter is built for efficiency thanks to a dual-action splitting ram that makes the work much easier. If you are planning to use this off the grid it will disappoint. Even though its HP engines are durable enough for both light and heavy-duty tasks, this log splitter is powered by electricity and therefore no good for off-grid use. We, however, managed to put the ED8T20 to work on some 250-foot logs from a pine tree. The logs averaged about 16 inches long with a 22-inch diameter and this log splitter was able to split through them with ease. In addition, there are a good number of users who report its durability over multiple uses for a couple of years. Some of the main negative reports from long-term users is the fact that the bolts on this machine tend to get loose over time. You might want to check that when you get your machine. Overall, the Boss Industrial ED8T20 comes with a 2-year residential warranty on its 3000 PSI hydraulic pressure pump which is great. The ED8T20 is built for those who need a log splitter that is easy to move around with one hand. It has a compact body construct that only weighs 160 pounds and the front handles are conveniently placed for portability. However, we found it to be a bit heavy than expected and even though the manufacturer claims it is a one-handed operation design, you might need to put in some effort while moving it around. While splitting the logs we loved the fact that the side rails kept the logs stable. In terms of how much noise this splitter produces, we were a bit skeptical at first on whether this would work in a home environment without disturbing the neighbors. The good news is that the noise from this log splitter is not that loud at all. If you are working alone, you will love this wood splitter as it comes with an automatic ram return that makes it easy to handle for just one person. The 2 HP electric motors on this log splitter run well on 115 VAC. You can expect it to draw about 13 amps of power which roughly comes close to the 1500 watts claim by the manufacturer. For our test, we ran the ED8T20 Boss Industrial on a 20 amp circuit with a 50 ft 12 gauge extensions and all worked perfectly fine with no mishaps. The downside is that if you are looking for a log splitter that is able to work vertically, the ED8T20 might disappoint you. We tried letting the wood move along and realized the vertical should be motor up and fluid down. Yes, it sounds a bit backward but just make sure the fluid stays where it’s supposed to without any vertical operations. Be sure to position your logs at a stationery wedge position. This will keep the log from moving along plus do not split the logs with the lever on. In fact, there is a warning sign that requires you to push the lever forward before slitting your logs. Also, the vent to this log splitter fits very loosely, therefore while working with it a split piece might fall onto the dipstick and knock it loose. We found that the best approach is to watch the splitting on the right side so as to prevent any mess from oil spills while moving the machine. The Boss Industrial ES7T20 Electric is one of the best on the market. It's a professional grade machine with durable construction and efficient components. It offers impressive performance, and it's quite easy to use even for complete beginners. Because it's as user-friendly, it makes a great addition to every house. More so, the combination of its features and specifications makes it that much more impressive. This impressive log splitter is ideal for outdoors and indoors use. It has built-in side rails that keep all the logs in place while the front handle provides easy maneuvering. The best of all is that it creates almost no mess and it's overall quite simple to use. This 7-ton splitter is made of sturdy materials and is approximately 106 pounds heavy. Its rugged construction and heavy-duty components make this one durable enough to last you for years. It’s designed in a way to endure heavy and large logs, while still being easy to use. You can tell by the way it’s built that the splitter will last you a long time. Plus, because of its durability, you can chop almost any type of wood. Though it’s not as heavy as you’d expect, the ES7T20 is quite powerful and rugged. If you try to lift it, you’ll notice the sturdy construction. This also means minimized vibrations so you can chop woods indoors, as well. The splitter has two legs and two wheels so you can actually pull it to the desired place. As we mentioned, it weighs 106 pounds that’s not overly heavy and allows simple maneuverability. Some people might find it tricky to lift it, but two people can do the job easily. It’s considered lightweight for what it is, but that doesn’t mean it’s really lightweight for you to carry it around. Use your best judgment if 106 pounds are okay with you. Plus, you won’t have to move it around that often anyway especially if you place it next to your batch of woods right away. It’s also important to note that the ES7T20 comes assembled so you won’t have to deal with that yourself. We used this one to cut several types of wood to figure out which one it’s best for. Our team tested anything from oak and cottonwood to fir, and we noticed impressive results. In most cases, you’ll be able to cut any log as long as it’s the right size. Plus, different types of trees might require a different approach to splitting. The manufacturer claims the splitter can handle 10-inch logs that are up to 20.5’’ long. For safety reasons, and ease of use, it’s best you only cut logs that fit into those measurements. Though you can go up and down the size a bit, it does perform the best when it has the right-sized wood. Don't let the small size of the Champion 90720 fool you. This 7-ton log splitter features an 80cc engine that is capable of swiftly powering through 19 inches long logs in 20-second cycles. Plus, it's an easily portable solution that also comes with an integrated log cradle for easy loading. This is our first pick for the best gas log splitter under $1000. The Champion 90720 is built for tough working environments. It features a cast iron sleeve that enhances its long-term durability and we have been using it in our tests for about a month yet it has consistently split through hardwood and any other type of wood. The only downside is that it's a bit slower than other power tools in its price range especially when you really put it through heavy duty tasks. However, if you are looking for a log splitter that will allow you to work with small logs over a long time period, this might be a good choice for you. Most users appreciate the Champion 90720 for its portability. It comes with wheels that are made for easy maneuverability. However, when we tried towing it with a car or truck, the Champion 90720 just couldn't handle it. As an alternative, we tried changing the tires to road tires and the results were much better. The manufacturer recommends you tow it at speeds of up to 45 mph and since it comes with a 2-inch ball coupler this option can turn out to be quite convenient for moving it around. Overall, this log splitter can easily be picked by two people thanks to the handle and the tire designs that never go flat. First of all, before you put the Champion 90720 to work you might have to take some time to assemble it. In our case, it took about 2 hours from start to finish which is not much if you follow the manual that comes with it. 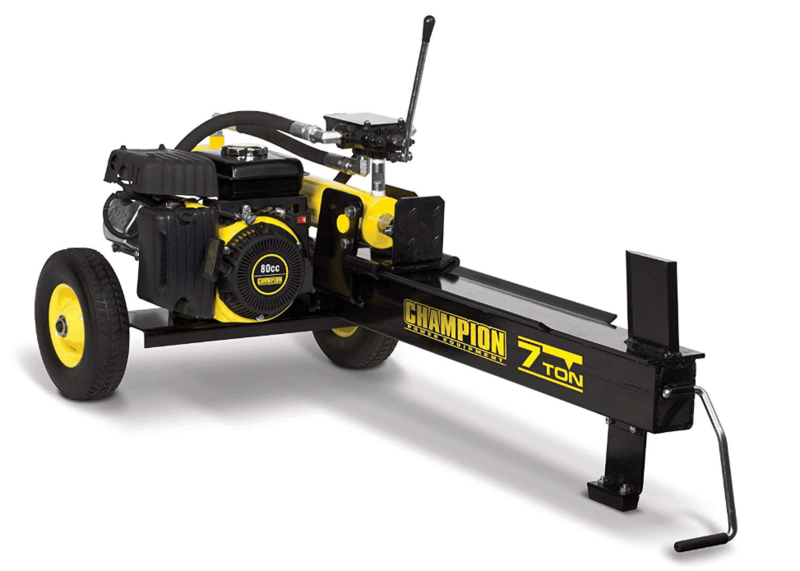 When it comes to splitting logs, however, the Champion 90720 packs plenty of power to get the job done. We put it through the paces by working with it to split freshly cut white oak logs and it was able to power through it without a problem. Its low to the ground profile make it easy to log big 18 and 19 inch logs on to the cradle without much effort. You can have an upside-down bucket to sit on as you work to reduce the need to constantly bending over as you load the logs onto the cradle. Also be sure to level the splitter perfectly according to the instruction in the manual or simply tilt it back towards the engine to keep air from getting into the hydraulic pump. Also, keep the engine half choked for about 5 to ten minutes before you move it to a running position to keep it from being slow to start every time. 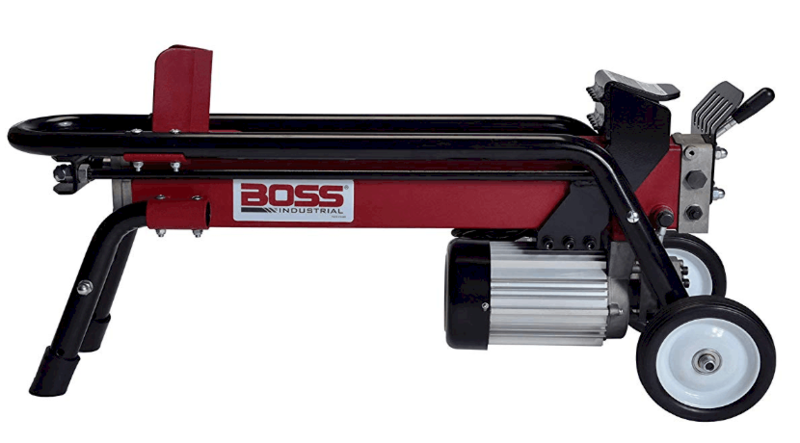 Over the years Boss Industrial has proven to be among the top manufacturers of lightweight, portable but powerful log splitters that get the job done. As a result, it is little wonder that the Boss Industrial ED8T20 makes it to our top pick. It does not only bring about the convenience of powerful portable performance, but this machine is also built to last long as well. If you think about it, using an axe is not only tedious but also energy and time-consuming. With that in mind, there is no doubt that you need a log splitter when the work gets overwhelming. With our list of the best recommendations, you can be sure to have the best log splitter under $1000. Keep in mind that log splitters can be dangerous and therefore pay close attention, read the manual carefully and wear proper clothing while working with your log splitter.